In 2013 SEGA began to release its 3D Classics range in the West, and we enjoyed a mix of Mega Drive / Genesis and Arcade re-releases such as 3D Super Hang-On and 3D Streets of Rage. A second wave of these games, primarily arcade classics, hit Japan; unfortunately the prospect of Western releases seemed distant with each passing month. In exciting news, however, SEGA has now confirmed that these titles will indeed make it to the West, kicking off in early 2015 — 3D After Burner II will be first up in 'early 2015', and then the following will all arrive on a monthly basis. The order of the latter four is unclear, but it has been confirmed that all five releases will cost $5.99 / €4.99 / £4.49, while SEGA of America President and COO John Cheng has been quoted as saying the following. These games were completely re-built to offer a robust 3D experience that offers more modern gameplay while still keeping true to the original. These are the best versions of some of our most unforgettable games and playing them is just like sitting in an arcade machine. We've been big fans of these M2-developed ports and have enjoyed the Japanese versions of these games; it's good news that they're finally coming to the West. Are you planning to pick any of these up soon? Let us know. Ooooh, Thunder Blade! Now that's interesting! Nice work, SEGA! I will be getting all of these. Don't really see the point in making it take until May though for all of them to be released. Wow did they wait long enough? Jesus. Now if only they'd do Rad Mobile. Finally Sega wants my money with a non Sonic related game. I want Outrun, AB and Fantasy Zone. Excellent. I've been looking forward to 3D OutRun. Anyway, I'll try out Outrun, never played it before. streets of rage 2, sonic 2 and 3, gunstar heroes then im on this train!!!! I'm going to have to get around to the 3d Classics someday. They're excellent. @santaglause You might want to buy 1 of these to show support so they think its worth it to bring others. Lots of SHMUPSs! Huzzah Sega! Huzzah! Maybe do a bundle deal for those people who want all of them? Just a thought. Sounds good to me, they can't get here soon enough. The Game Sack folks will be happy! I'll be picking up one of the Fantasy Zone's for sure and maybe Outrun. Yay, I will buy them all! I'm not even lying when I say these are all the 3DS games I need for 2015. Aw yeah I was just thinking about these last night. Getting Afterburner and Outrun for sure. Glad to be proven wrong. Yea baby!! Day 1 purchase for all 5 for me!! But Mr. Cheng, when will you guys start with Wii U vc support?? C'mon man!! I can think of 50 SEGA classics right off the top of my head!!!!! Let's go!!! Still waiting for Shining force 1 & 2 to get a 3d release and they would work very well. I'd get all but the Fantasy Zones, never really enjoyed those games. Great to see the arcade version of Thunder Blade, as I dont think its seen a past SEGA AGES release. How about the arcade versions of Turbo OutRun or Golden Axe 2, Turbo OutRun was woeful on the Megadrive and Golden Axe 2 good, but a very different game. I'm glad Sega is doing this. Wish nintendo would do more of this with their classic games. Where's Sonic 3? Or Sonic & Knuckes? Outrun and both Fantasy Zones for me!! I spent days playing Fantasy Zone I on my GameGear!! Why just Nintendo see the potential of GBA games on the 3DS? It baffles me beyond understanding!!! Oh how I would pay for 3D OutRun and 3D After Burner II. Hopefully they had a 3D Phantasy Star and a 3D Shining Force sometime in the future too. Where is the original " TURBO" I pumped some quarters into that game. I have never seen this released anywhere. Would love for this to be released. Is this like some treasure like Disney does with their vault ? Going to have to grab all of them when Sega do some sort of a sale. Now release OutRun 2 for the Wii U eshop and I'll be set as far as the OutRun games go. This is music to my ears! I will be saving some duckets up for these gems! Outrun I'm most excited about! fantasy Zone will also be mine! @retro_player_22 I would love to see a 3D Shining in the Darkness. That game never seems to get its props. Such an excellent dungeon crawler, in 3d would be amazing. Though I personally am not interested in any of these games it is definitely nice to see them make it to the west! I'd beg, borrow and steal for a retail double pack of all the games, especially if they had Ken Sugimori box art. Great news that we're finally getting this second batch. Nothing from the first set called out for me. Now I'm hearing some noise. @SparkOfSpirit Sadly, they cant sell OutRun 2 online anymore as they dont have the Ferrari License... I regret missing that one on PSN! Awesome news! Will be picking up After Burner II and Outrun on release. Me too. At 30 bucks for each batch, they'll sell tons! Sega's selecting far more interesting titles than Nintendo did for their 3D classics line up. as much as I love Kid Icarus(Nes) it was a baffling choice to select it in the NES 3D series. Those new backgrounds looked awful and totally unfitting....Urban champion? who in the heck wanted that? Xevious was 'ok' The other 3, Excite bike, Twin Bee and Kirby's Adventure were the crop of the crop imo. as for the sega 3D classics, I've only played altered beast and Space harrier and both are extremely impressive, PLUS the wealth of options! Outrun and After Burner II day 1 purchase. Thanks Sega, I'll be buying all of these. it's a shame that we got three less games than last year, but at least they're all arcade based. Last year's concentration on Genesis games didn't do much for me. Why can't SEGA make better games like porting their masterpieces well? If Sonic Boom doesn't do well, that's it. SEGA can't even rely on western devs to make even a decent game. After Burner and Outrun must be mine! I'll get them all, I'm a Sega fanboy from back in the day. 2 fantasy zome games? awesome!!! i will be getting both fantasy zone games day 1. Afterburner and Outrun hurry up! Now if they'd only give us the PHYSICAL release they did in Japan on an actual game card!! please bring the the rest of the classic Sonic's. The first one in 3D looks gorgeous and the circle pad feels so tight in the game! We need da rest! Are any of these online ? I mean if your going to redo something a bit you minus well give it online play these days. Outrun will be first day perch. 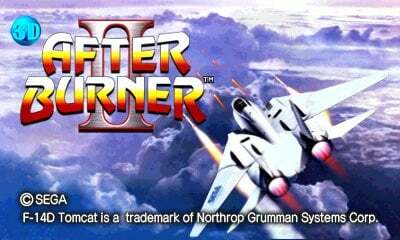 Also After Burner II very likely! I hope Sega commissions M2 to work on Sonic 2 and Streets of Rage 2 3D classics. Those two were the best games in the franchises! Fantastic. After Burner and Fantasy Zone for me. Does Big N realize that OutRun has never made it onto one of its consoles??? For the love of Little Mac, please get these games on the Wii U eShop!! loved these 3D remakes, bought four of them and will get afterburner and outrun. i really like the CRT display mode option - feels authentic and nostalgic. If they announce Sega Rally Championship, I'm in. Afterburner and Outrun?! Yes please... Now make Outrun 2 HD on Wii U! That'd get my money too! Although I'm okay with my Outrun 2 Special Stages arcade machine... BUT STILL, It'd be a worthy eShop investment!! None because they don't hold any interest to me. Why no Sega RPGs? I want a 3D classics Phantasy Star 1-4! @andreoni79 I don't get it, you want Nintendo to make old games instead of new games? With all the new games Nintendo is making and new consoles they are still developing, they have no time to constantly give us old games in 3D. Just be glad Virtual Console exist. @retro_player_22 Making these Sega remakes can't be so expensive and hard. I'd prefer to see Nintendo treating only their best games in Sega style instead of porting even their worst **** just to fill up the VC list. @andreoni79 Well a lot of their VC offering aren't that bad though, you got the Donkey Kong Country trilogy, some old NES and SNES classics and even some offering from the likes of Capcom and Konami as well. Also if 3D classic Nintendo games is what you are looking for, they got Majora's Mask 3D coming as well. @sinalefa Ditto to everything you said. @Windy Ditto to what you said too! @WaveWarlock Sega is single handedly saving the 3D Classics. I just hope they continue to do so and don't drop the ball like Nintendo did. So many games should get the 3d treatment. @andreoni79 I would love to see Nintendo do like sega is doing and bring their good games to the 3d classics instead of VC. Besides who ever in charge of the VC "Your Fired!" You are doing a horrible job still after all this time. Lastly there are so many PCEngine/TurboGrafx games which would look awesome with the 3D treatment! Konami where are you? Outrun and Afterburner look good I have truely no experience with Fantasy zone but the shooting sound annoys me in the trailer so that kinda throws me off.